Nagpur: Rashtriya Swayamsevak Sangh chief Mohan Bhagwat was wary of the situation India is currently in, compared to the countries like Israel and Japan. He viewed that despite Israel fighting many wars, it is still one the wealthies nations but India is still struggling for the basics. He said that only an Army man cannot promise a better future. The society is equally responsible for it, he added. He spoke about patriotism, education of youth in today’s world and narrated stories from all over the world during the event. “Indians go on vacations to foreign countries but we still haven’t seen beautiful bridges in Arunachal Pradesh. Speaking about education, Bhagwat said the youth needs to be taught more than to just care about jobs. “Education should be such that it serves the country and not just a family. Education that is job-centric is not an asset to a nation,” he said. 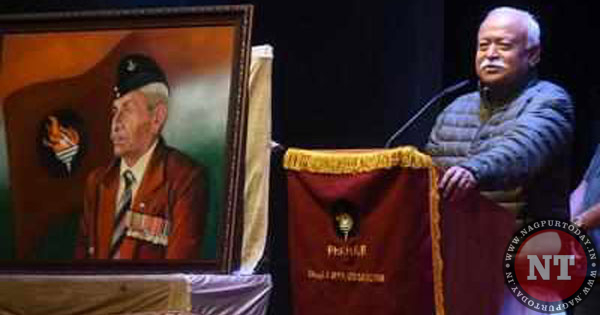 He was speaking as the chief guest at the concluding ceremony of the weeklong silver jubilee celebrations of Prahar Samaj Jagruti Sanstha at Suresh Bhat Sabhagruh. Bhagwat said a small country like Japan survived dire consequence of Hiroshima-Nagasaki atomic bombings and bounced back spectacularly. But India is still struggling, financially. “Britishers did not leave India high and dry as we had Rs30,000 crore in our national treasure and Rs1,600 crore were to be obtained from them. We had readily available fertile soil, a young enthusiastic population and financial assistance. Yet, we still failed to develop it with that quick a pace. What is worse that we are fighting wars to prevent it from splitting into pieces,” said Bhagwat.